Depending on how large, heavy, fragile, easy to handle or complex your less than a truckload (i.e. LTL) freight shipment is, it should be priced fairly. Please see our How to Calculate Freight Density infographic below or click here to see our Freight Density Calculator page that we posted on Freightera website. Make sure your measurements include all packaging like skids, pallets, crating, etc. Round your measurements up to the nearest inch. For multiple pieces, make separate measurements. It multiplies 3 dimensions of your shipment to get total cubic inches. It divides total cubic inches by 1,728 to calculate the total cubic feet. It divides total weight of your shipment by total cubic feet to get the density in Pounds per Cubic Foot (pcf). 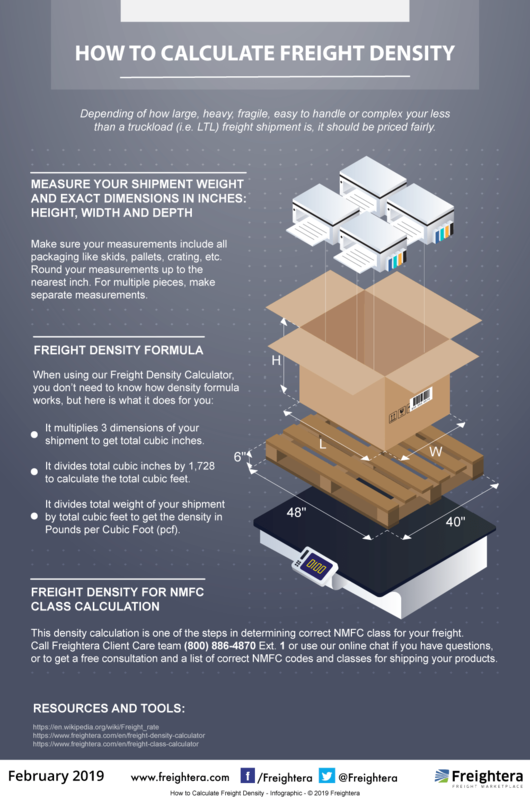 This density calculation is one of the steps in determining correct NMFC class for your freight. Call Freightera Client Care team (800) 886-4870 Ext. 1 or use our Online Chat if you have questions, or to get a free consultation and a list of correct NMFC codes and classes for shipping your products.